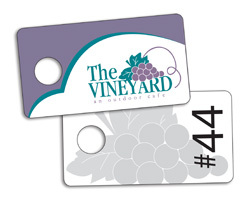 Coat Check Tags can be used in restaurants, wedding halls, bars, dance clubs or social clubs. They are also a nice touch for corporate events and balls. Card thickness can range from .018" to .030". They are also coated with a high gloss laminate for a brilliant finish. The standard size is 3" x 1.625", but Plastic Works can accomodate a variety of sizes and shapes. Coat Check Tags are personalized with sequential numbers in sets of two. Split Ring (A) unattached $.06(v) each. Split Ring w/ key tag tab (B) unattached $.09(v) each. 4 1/2” Ball Chain (C) unattached add: $.06(v) each. We attach any accessory for an additional $.20(v) per piece.